Milly loves her dog Hugo. And she LOVES dressing up Hugo in bows. Hugo loves Milly, but Hugo does NOT like wearing bows. Not frilly ones or sparkly ones or bows with jewels. Finally, Hugo can’t take it anymore and he runs away! But life is lonely without Milly. He starts to think that maybe bows aren’t so dreadful after all—and maybe life is better with a friend by your side. Readers will laugh out loud in debut author-illustrator Samantha Cotterill’s delightful picture book about a dog and his girl. Samantha Cotterill, also known as mummysam, has been drawing since the early 1980s, when she discovered that her doodles could be traded for gum and candy in the lunchroom. Samantha now creates illustrations and stop-motion minifilms out of her home in Upstate New York, which she shares with her husband and two boys. 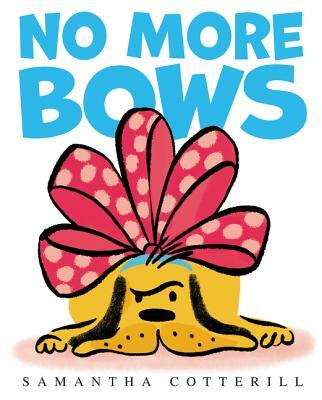 No More Bows is her first picture book. You can visit her at www.mummysam.com.